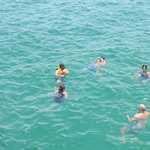 Provision of Snorkeling equipments, Life- jackets. Driving through the breathtaking view to Oman border, Tourist can now take advantage of visiting Oman border for a full day real experience in Dhow cruise. 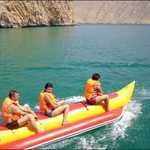 Musandam Khasab is the most charming and breathtaking city in Oman. 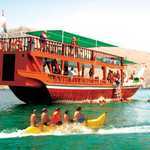 Khasab trip is a promise to enjoy the fords and the exciting cruise along the crystal clear waters of Musandam. Oman Khasab trip boasts an elegant view of the mountains and natural vistas. The cruise on the traditional Omani dhow would take you to different islands making you admire the Bedouin stone hamlets laying on the coastline. You get a chance to spot Dolphins as well during your cruise. Enjoy an unforgettable day cruising through the “fjords of Musandam Khasab” on board a traditionally decorated dhow .You can discover ancient villages and swim in clear waters of telegraph and seebi islands. You can enjoy view of highest peak of musamdum mountains, visit Portuguese fort of khasab and prehistoric rock carvings village of qadah. Enjoy the scenery just by relaxing in your dhow with cushions and carpets. Ironically this tour is meant for romantic couples and families to spend quality time together. Some nationalities having U.A.E resident cards or Tourists Visa in U.A.E are not allowed to trespass the Khasab border. In such case please contact us and know if you are applicable or not. 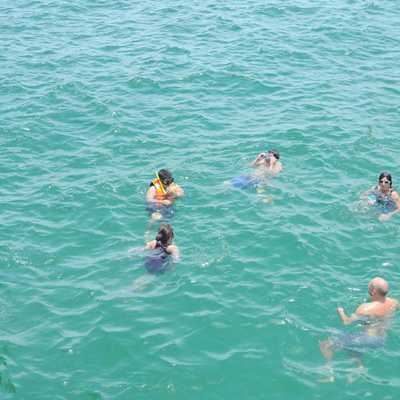 The Musandam - Dibba trip and its activities are dependent on sea / weather conditions. Trips may be rescheduled with / without prior notice due to such reasons. All Details required to travel should be emailed to us 72 hours prior to the trip.